This breaded fried fish recipe is mildly spicy. It would be good served as a starter with some chopped salad leaves, cucumber, tomato and onion, with lemon wedges and a minty yoghurt dressing. 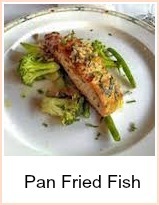 The instructions are for plaice fillets, but most white fish would be suitable. It can be called 'goujons' if you want to be posh! If not, fish fingers. The strips would be great for filling tacos or you could give them to the kids with some mayonnaise or tartare sauce for dipping. 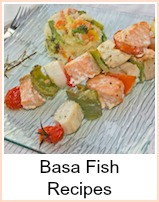 Cut the fish into 3/4 inch (2 cm) strips and put them on a plate. Mix the salt, pepper, cumin, turmeric, cayenne and corainder together. Rub the spice mixture into the fish and leave for 15 minutes - turn the fish, rub the spices in again and leave a further 15 minutes. Put the eggs into a dish and the breadcrumbs onto a plate. 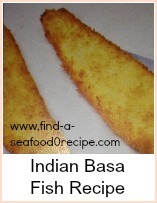 Dip the fish strips into the egg and then into the breadcrumbs, making sure they're evenly coated. Heat about 1 cm (1/2 inch) of oil in a frying pan and put in some of the fish - not too crowded or they won't cook evenly. Fry for about 2 minutes each side until golden brown. Drain and keep warm while you fry the rest of the fish in batches if necessary. 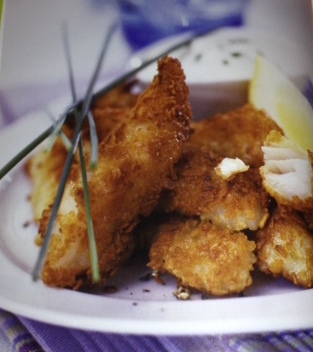 Gorgeous recipe for breaded fried fish - these are great as gluons an which you could put inside a taco, much like Rubio's Fish Tacos - add some salad and coleslaw with fries for a great meal.